Share "DIY Indoor Succulent Garden"
Houseplants have many wonderful benefits – they purify the air, enhance mood and even improve focus and concentration. Succulents are some of the easiest and most versatile houseplants to add to your décor, and creating a do-it-yourself indoor succulent garden is a great way to bring these beauties into your home. It just takes a few simple steps to create your own arrangement of lush and lovely succulents. One of the most wonderful things about indoor succulent gardens is how creative you can be with them. Because these plants come in many sizes and shapes, nearly any type of container can be turned into a succulent planter. The slow-growing nature of succulents means the container doesn't need to be deep to accommodate their roots, and you can easily turn the most unique container into a planter. Wide, shallow bowls or pots are popular, or you might consider using a wine glass, wooden trough, mason jar, mug, shadow box, old bucket, candle holder or even half of a large shell to make your garden. Succulents do not like wet roots, so it is essential that your container has proper drainage. If possible, the container should have a hole in the bottom, but you can also provide good drainage by adding 1-2 inches of gravel in the bottom of the pot. If there is a hole, covering it with a small piece of screening or a scrap of newspaper will keep the soil from falling out. Fill in the base of your pot or planting container with a succulent-friendly soil, such as a cactus and succulent potting mix with plenty of drainage. Mixing sand and vermiculite or similar materials into regular potting soil can also improve the drainage so it can be used for a succulent garden. 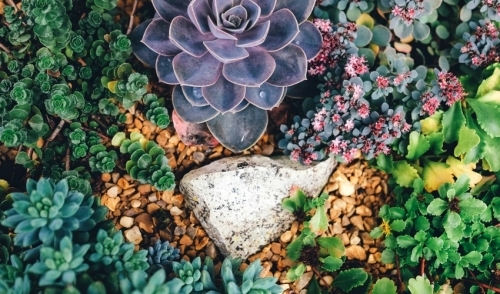 When choosing plants for your succulent garden, opt for different shapes, colors and textures to provide the arrangement good visual interest, but be sure all the plants have similar care needs so they will stay healthy together. Take time to position the plants around the pot, and don't be afraid to keep them snuggly together – because they grow slowly, they don't mind being crowded. A trailing plant may look nice near the pot's edge, or opt to surround a larger specimen with smaller plants. After you have set the plants in their proper positions in your garden pot, fill in around them with more soil, tamping it slightly firmly around each plant. Do not bury the plants, however, and avoid planting them too deeply which could cause root rot. Top off the planter with a decorative material if desired – a top dressing layer of gravel, sand, glass marbles, sea glass or crushed shells can be an attractive way to bring the garden together. Succulent gardens can be fun to accessorize, and you may want to turn your indoor garden into a fairy wonderland with miniature props. Other options include adding a larger "boulder" or large seashell to the arrangement, or incorporating moss around the plants for a finishing touch. After planting, water the garden by misting it carefully with a spray bottle, but take care not to overwater the plants. Succulents can rot if they are overwatered, and it is better to allow them to get a bit dry rather than to keep them a bit wet. If they are dry they will begin to wrinkle or shrivel, but will recover after they are watered again. Even indoors, succulent gardens do best in full sun or in a position where they will get several hours of good sunlight each day. Avoid putting the garden near a heating or cooling vent that will create temperature extremes, however. A succulent garden can be ideal on a mantelpiece, the corner of a desk or on a kitchen table – anywhere you want to add a touch of greenery to your home décor, you can create a succulent garden to be a perfect fit!